A very good friend made this soup recently for her family and they loved it. I thought "hmmm, why haven't I made this for a while... we love it too!". So, I made a batch and it definitely hit the spot! 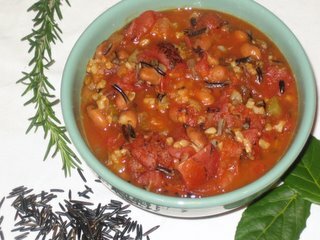 Rich with flavor from herbs and seasonings, this Roasted Tomato Bean Stew is also hearty with both wild and brown rice, and beans. I use Muir Glen Fire Roasted Diced Tomatoes in this recipe, however you can use regular diced tomatoes and then add in extra seasonings as I've noted in the recipe (p.78 Vive le Vegan!). This soup was on my next "To Make" list from Vive! Mmmmm that looks delicious. I just might have to make this if the weather keeps on as miserable as it has been. Looks so good and comforting. Okay, now my mouth is watering. I am definitely going to buy your book, just for this recipe! Thanks Melissa, Sarchan, and Amy! I just got Vive Le Vegan from the library. Any suggestions of which recipes I should try first (they have to be gluten free or have gluten free options, so most baked goods are out)? Also, the Totally Nutty Bars are in the Muffins/Snacks section and are gluten free, whereas most of the muffins/baked goods are just wheat-free. Thanks Dreena. You're so helpful! I think that I might try the Chickpea Ratatouille and the Brown Rice Pizza first . That looks so body-warming! I'll have to check out your book from the library again (I'm on a tight budget, unfortunately). I made the maple cookies quite a while ago and they were such a hit! A friend of mine came over today to go grocery shopping with me. She wants to try becoming a vegan! I had some Tomato-Lentil Pasta Sauce in the refridgerator so we had some spaghetti. She loved it and said she felt like she was eating in a restaurant! We're doing (another!) unit on food in French and one exercise has to do with "dealing with vegetarian guests." Madame will most likely allow us to bring in food. Maybe I'll get to set up a vegan restaurant! hey dreena, made your Chickpea Ratatouille for supper tonight, and it was really good! everyone ate it all up, and there's some leftovers for lunch tomorrow... might try your idea of making it into burritos w/ some vegan cheese. Hi 'Sconed' (and welcome)! If you can get Vive from your library again and you liked the Maple Cookies, also try the Peant "Better" or Double Chocolate Almond Explosion - or click the link to the Homestyle Choc Chip recipe on my posted recipes page! Hey Mal... glad you both liked that sauce. Always sharing you are! You are bringing awareness into your school with your vegan food and ideas - great stuff! Hi Michelle... well, thanks for the warm and fuzzy compliments, much appreciated! Also my thanks for featuring my recipes on your blog!! I love the Chickpea Ratatouille myself, one of my favorites, esp when I can make it with chickpeas that I have cooked in advance - they just taste so much better than the canned - but I'm not always that prepared with the kidlets (as you know I'm sure!). The oat bars are great too because they aren't too sweet and are very wholesome and filling. We also had sweet potato fries and she had some Roibos. She fell in love with both! Her parents called from the grocery store and she asked for them to buy her sweet potatoes. I'm avoiding my English homework right now, so maybe I should make my English teacher some cookies. Mal, I'm really into sweet potatoes right now - making sweet potato fries and yam fries. I think it's the time of year, they are very comforting. I esp love having them paired up with spicy food like chili - yum! Hi Miriam! Vive is my newer cookbook, so I probably have a tendency to feature more recipes from it! Both books have sold about the same, but Vive is more popular now for sure because it is more recent. I think Vive is the best choice for you for a couple of reasons..
Madelyn, let me know how you like the soup... I will e-mail about getting together! Thanks! Oh YUM! I'll have to try this! Come check out the Avocado Hummus I made. I am embarrassed to say that I don't have your cookbook yet (I haven't been able to find it locally) but I might try the library here - haven't been there in a while. OR I will have to buckle down and buy it online. I try and shop local but when they don't have what I want - what else can I do? Oh, Harmonia... shame on you! :)!! Got back from the library today and they only had two vegan cookbooks TOTAL. I will have to get it on Amazon...not a prob.